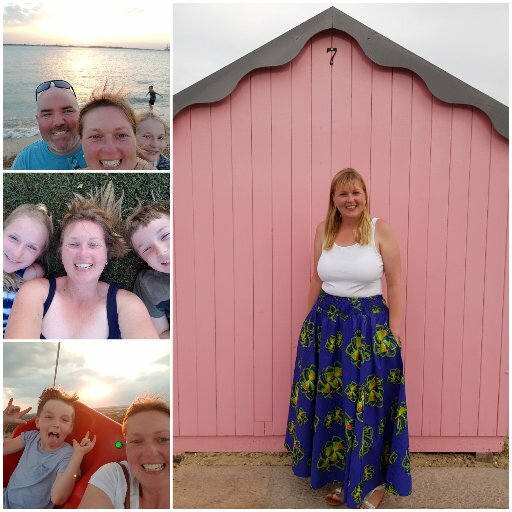 I have done Slimming World on and off for years. 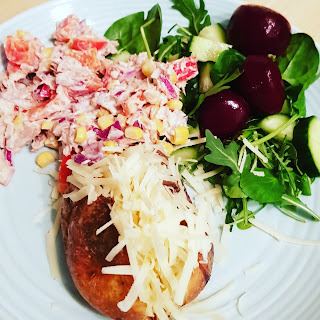 Recently I re-joined so thought I would share a week of Slimming World evening meals. 1. 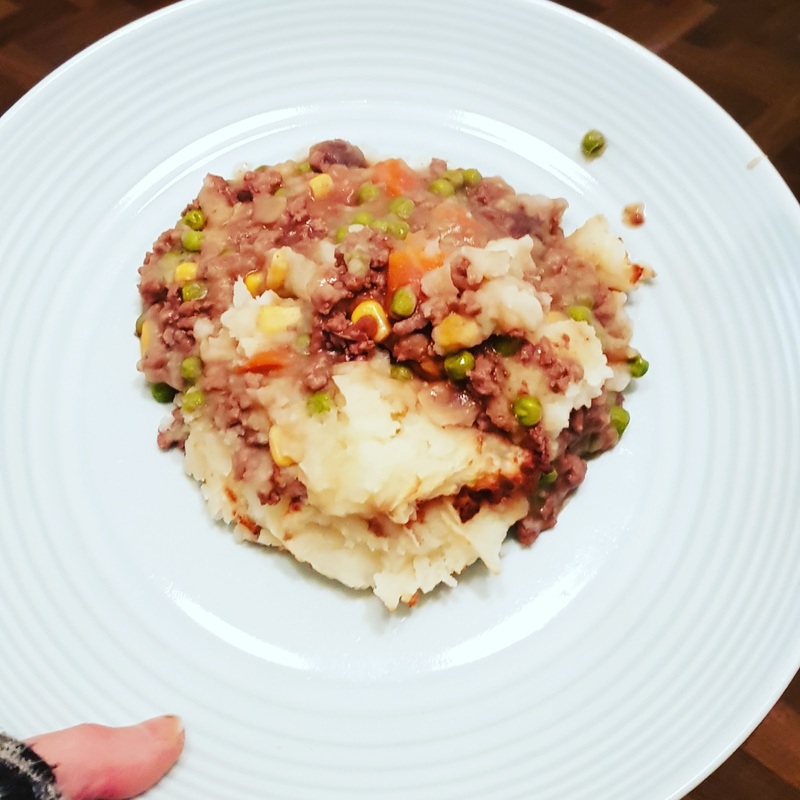 Shepherds pie (technically cottage pie as beef but I always call it Shepherds pie whatever the mince!) 5% mince and lots of veg. I always put peas, sweetcorn, onion and mushrooms in mine. I usually put a splash of milk in the mash potato and about a tablespoon of gravy granules to the mince mix. 2. 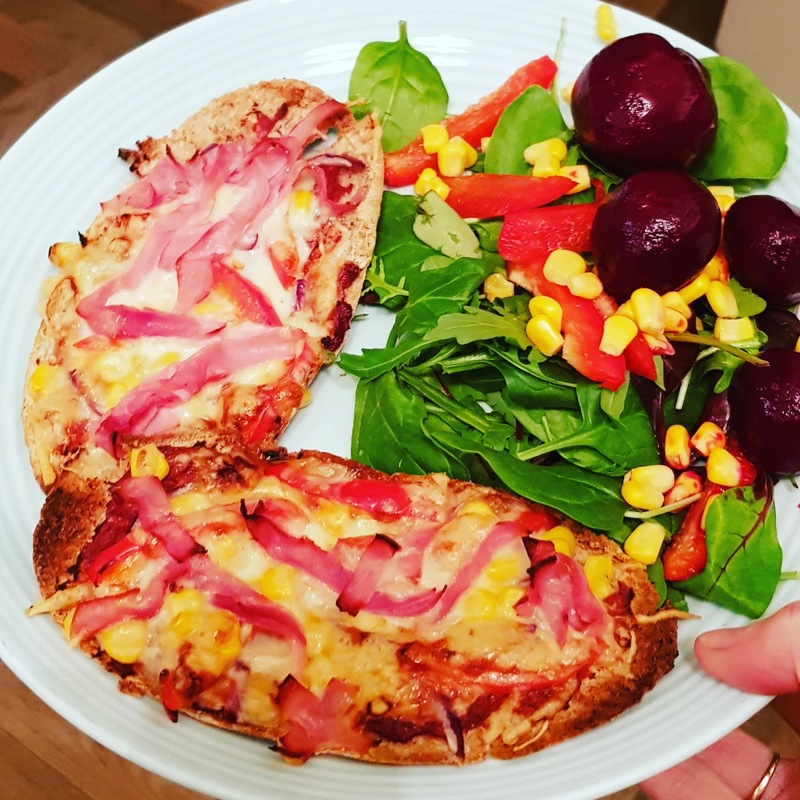 Pitta Pizza - Use a wholemeal pitta cut in half (HEXB) and spread a thin layer of tomato puree over. Then add whatever toppings you want. I usually put red onion, red pepper, sweetcorn, sliced mushrooms and ham. 40g 30% fat cheddar (HEXA) grated is then sprinkled over the top 20g on each. Put on a baking tray and in the over on 200 for approx. 10 mins. Serve with a big side salad. 3. The good ol' jacket potato - Prawns, beans, cheese (HEXA), tuna, chicken the world is your oyster. Serve with a big side salad. My favourite is tuna mayo using light mayonnaise. 4. 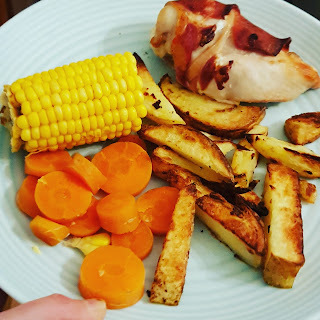 Chicken wrapped in bacon with chips - To make the chips I part cook the potatoes in the microwave and then slice. Spray with frylight and season. I often add paprika or garlic powder. Cook for 20 to 30 mins (depends how crowded your tray is). Serve with mushy peas, beans, veg or side salad. I usually just go with whatever I have left. On this occasion my veg/salad draw was a little low. Carrots are speed. Corn on the cob free. 5. 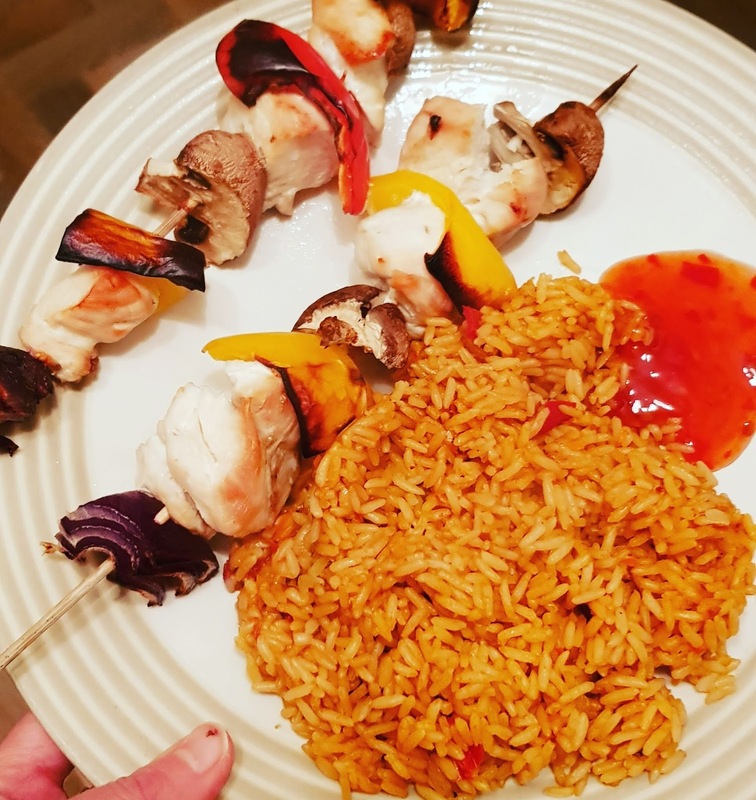 Chicken kebab with rice. Chicken diced and threaded on a skewer with peppers, mushrooms and red onion. I serve with Uncle Beans rice at 2.5 per pouch and some sweet chilli sauce 1.5 syns per tablespoon. Plain boiled rice would be syn free. 6. 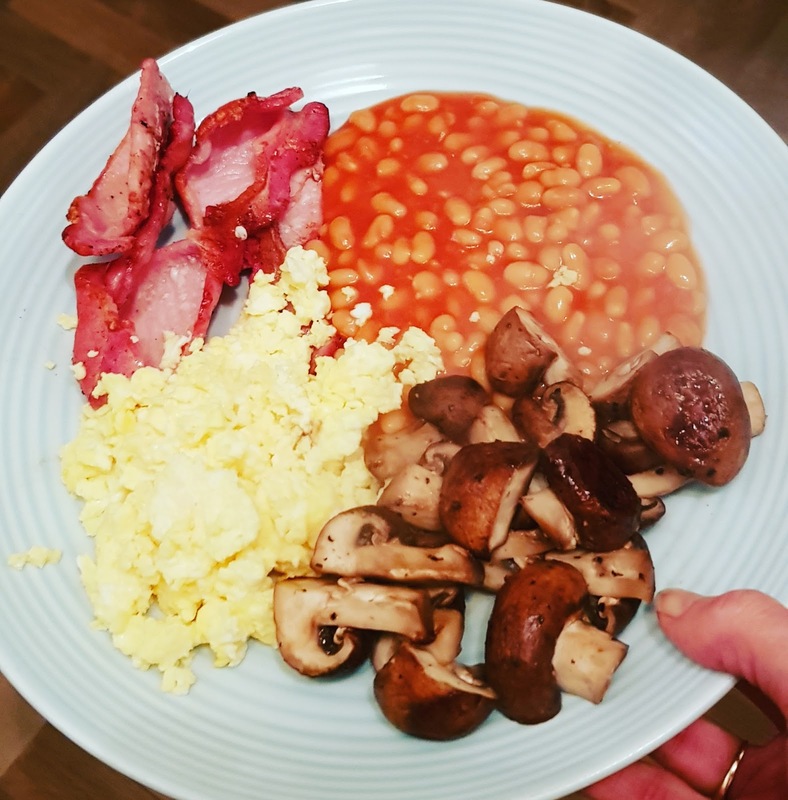 Good ol' breakfast dinner - A quick meal if you are in a rush. Beans, scrambled egg, mushrooms, bacon all fat removed (medallions are easier) and wholemeal toast (HEXB). 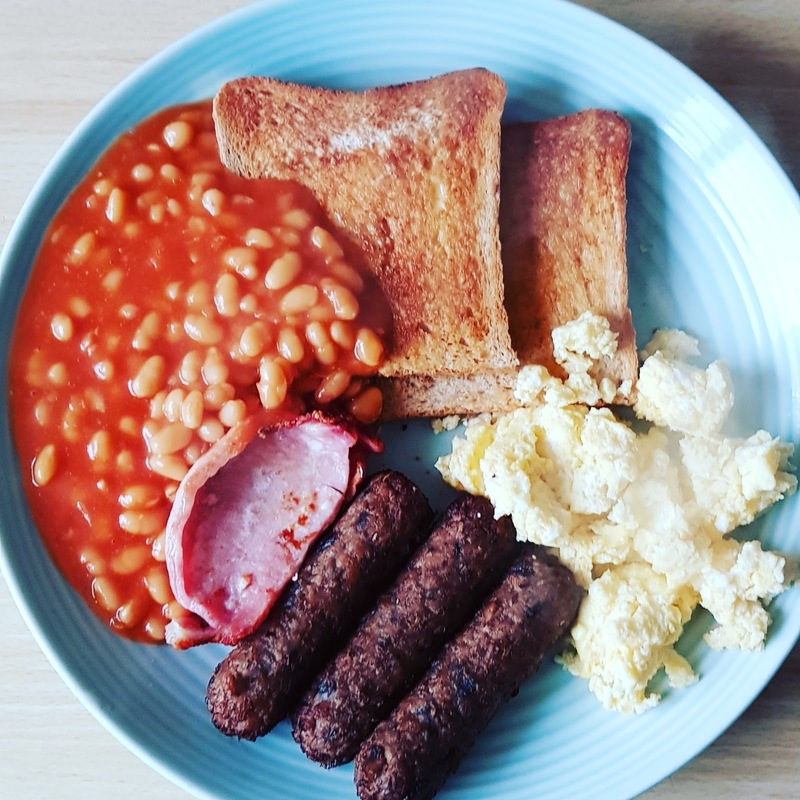 Can also add hash browns, if shop bought will need to syn or Linda McCartney sausages free to 1 syn per sausage depending on type. 7. 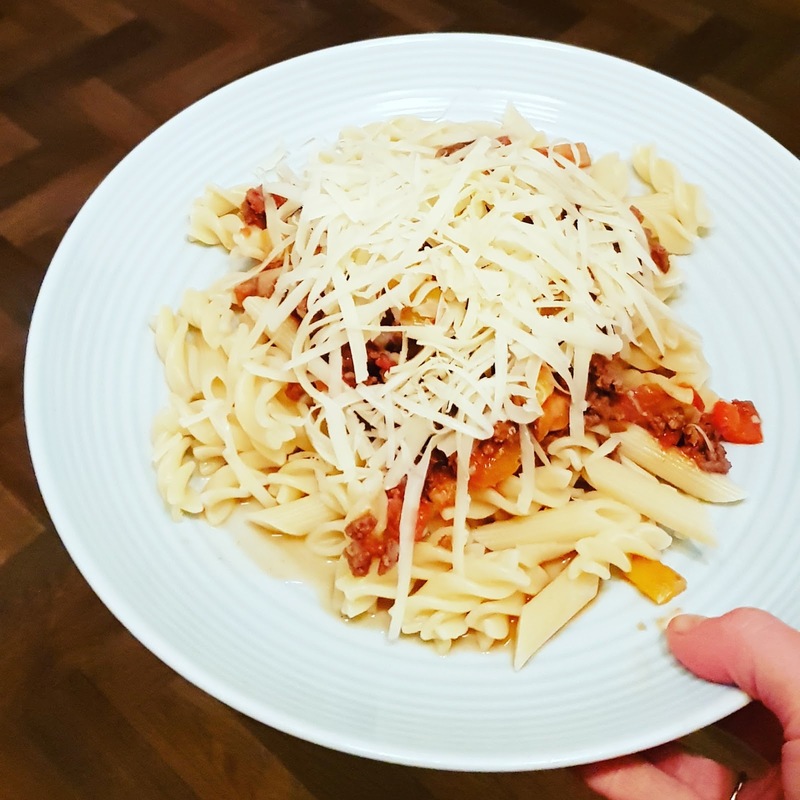 Spaghetti Bolognaise - A good crowd pleaser. 5% mince. I pack it with veg. Couple of carrots diced, 2 or 3 peppers diced, mushrooms sliced, onion diced, garlic and tinned tomatoes. I often add an oxo cube for added flavour. 40g of cheddar (30% less fat) is HEXA. So they you have it a week of Slimming World evening meals. Not ground breaking but easy and family friendly. My children eat all of the above (with the exception off eggs and mushrooms - they fish them out and put on my plate). This means no cooking separate meals which is a win-win. Some of these meals can easily be adapted if veggie. 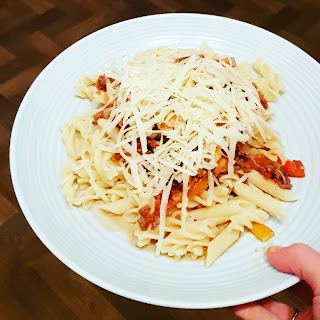 Quorn mince in the Shepherds pie ad Spaghetti bolognaise. Omit the bacon from the breakfast meal and the Jacket potato topping can be changed simply.